The film on everybody’s lips at the moment, The Favourite, with its scabrous depiction of life at the court of Queen Anne, has won a Golden Globe for its protagonist and amassed 10 Oscars nominations. One of these may well go to its costume designer Sandy Powell, whose innovative creations are currently on display at Kensington Palace. Powell presents a “punk-rock” stylisation of Queen Anne’s court, not always constrained by absolute historical accuracy. Having said this, budget and time were major constraints, pushing her to innovate, using modern techniques and materials to recreate period ornament and detailing. Lace, which abounded at this time, could often cost more than the fabric of a gown (1). Powell’s lace, however, was laser cut, making it a quick and cheap alternative. Similarly, the costumes’ black detailing, is in fact laser-cut vinyl and leather. 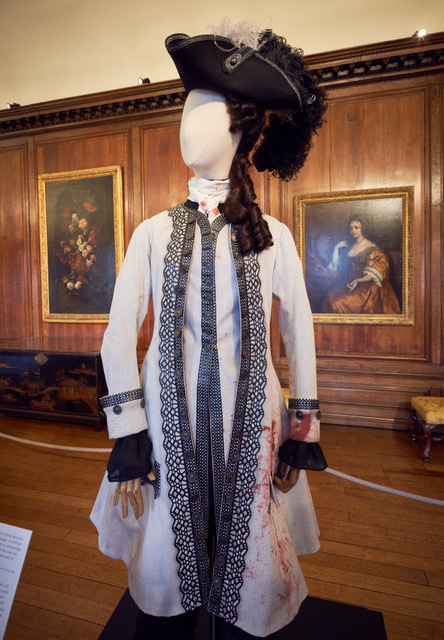 Not only does their decoration bring a twenty-first-century twist to these period costumes, so too do their fabrics, which stem from a variety of unexpected modern sources (2). The Queen’s dressing gown, for example, is lined with a quilted bedspread bought on eBay. Likewise, material for the housemaid’s dresses was foraged from charity shops in the form of second-hand jeans. Housemaids rarely wore uniforms in this period and often they were denigrated in the press for their excessive finery. Powell’s use of denim references another historical tradition, however, as this fabric was first used for sturdy workman’s apparel (3). Aside from the housemaid’s dresses, there is very little colour in Powell’s costumes. She instead chose a strikingly monochrome palette. In reality, Queen Anne’s court would have been a far more colourful place as expensive dyes made colourful clothing a great way to show off one’s wealth. Furthermore, the complex sartorial guidelines following the death of a loved-one meant that a lack of colour was predominantly associated with mourning (4). Despite historical inaccuracies, Powell’s costumes do evoke the period that they represent. This is in part because they remain faithful to the silhouettes of the period. Women of the court wore a complex structural gown known as a mantua, with a train pinned up in elaborate folds to reveal contrasting petticoats. This style reflects both the fashions of the time and the film’s themes of female empowerment and freedom. This is because the mantua was the first fashionable, outer garment to be made entirely by women, for women and, although almost unfathomable to the modern eye, it was also more comfortable and more freeing than the styles that had preceded it (5). Unlike the stiff, heavy grand habit, the mantua had begun as a loose, unfitted nightgown worn in private, giving it risqué undertones, even when it had morphed into a more formal, elaborate gown (6). The mantua also allowed more freedom in terms of personal expression. As Powell discovered, with a stomacher, a petticoat and the mantua itself, the wearer could mix and match elements to create different styles. It is not the Duchess of Marlborough’s mantua, however that most underlines her freedom and strength, but her riding and shooting outfits. Their striking masculinity may not seem historically accurate but there was a level of androgyny in women’s sporting dress at this time. The diarist Samuel Pepys complained of ladies out riding that ‘only for a long petticoat dragging under their men’s coats, nobody could take them for women in any part whatever’ (7). I dread to think what he would have made of the piratical duchess’s leather trousers; they would have caused quite a scandal, even if the rest of her outfit reflects trends of the time. While the women of The Favourite find strength in simplicity and masculine shapes, the men are ‘fluff in the background’; effeminate, preening and foppish. 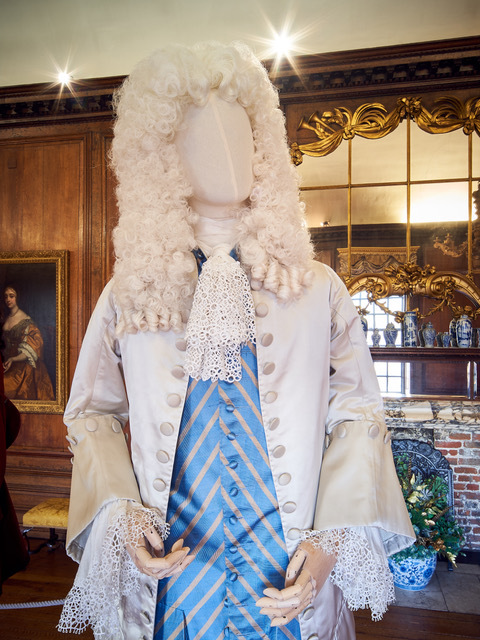 Their costumes reflect fashions of the time, but they are exaggerated as the English were noted for their plainness of dress, reserving embellishments like lace for special occasions. At this time, such excessive exuberance in male dress would have been much more at home in the French court (8). Fitting perhaps, as Robert Harley, by far the most lavishly dressed, peacocking member of court, is also the most vehemently opposed to war with France. Could it all be a ploy to get his hands on new cravat? 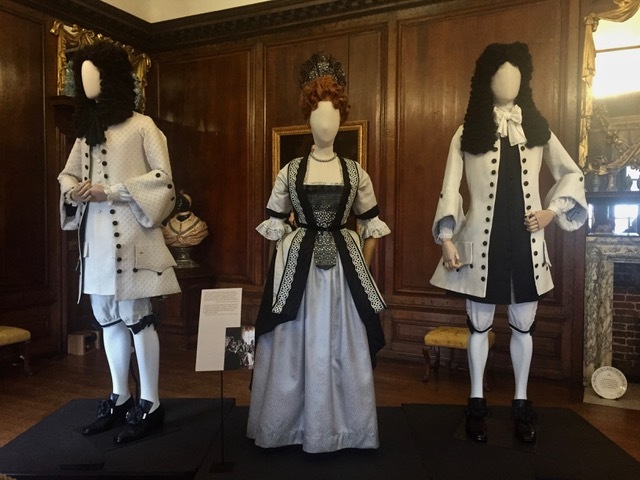 The costumes used in The Favourite are on display at Kensington Palace until the 9th of February and Hampton Court Palace until the 10th of March. 1. Anne Buck, Dress in Eighteenth-Century England (New York: Holmes & Meier, 1979), p.19. 5. Avril Hart, “The Mantua: Its Evolution and Fashionable Significance in the Seventeenth and Eighteenth Centuries,” in Defining Dress: Dress as Object, Meaning, and Identity, ed. Amy De La Haye and Elizabeth Wilson (Manchester ; New York: Manchester University Press, 1999), 93–103. 6. Aileen Ribeiro, Dress in Eighteenth-Century Europe: 1715-1789 (London: Batsford, 1984), p.34. 7. Buck, Dress in Eighteenth-Century England, p.52.